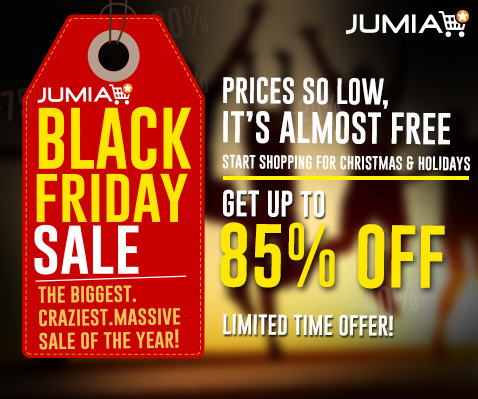 If you love cheap but quality products then Jumia black friday is for you. Jumia is offering upto 90% off their products during this one month period from 13th november till 13 december. Black friday sales has been on since 2003 and i must say that Online stores like Konga.com, Jumia, etcetera are the ones that popularised Black Friday sales in Nigeria. It is simplely a day set aside for unbelievable discounts on most products in some shops. The Black Friday festival sales originated in the United States (US). It marks the Friday following Thanks Giving Day in the US. It is the Friday after the fourth Thursday in the month of every November. Since 1932, maybe because of its proximity to Christmas, it has been regarded as the beginning of the Christmas shopping season in the US and most major retailers open very early to offer promotional sales. The Online giant store Jumia has made it public that its Black Friday sales started on 13th and will run till the 31st of next month. They will start flash sales of items till the big day which is the last Friday of this month and then continue its sales till December. The e-commerce giant has partnered with Intel, Pampers, Infinix, Philips, Fero, HP, MTN, AirFrance-KLM and about 1,000 top brands. GET 80% OFF ACROSS ALL CATEGORIES, PLASMA TV’S, GENERATORS, WASHING MACHINES, ELECTRONICS, IPHONES, TECNO SMARTPHONES, INFINIX, SAMSUNG.